Nollywood actress, Beverly Osu, is known to not just be an actress but a model, who is ready to tell stories with everything around her but her stories might not be appreciated by all. 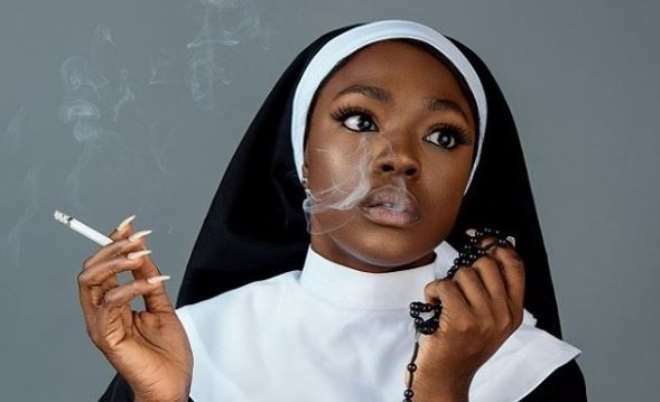 The actress recently left some people talking when she shared photos of her dressed in the Catholic Sister’s outfit while smoking. Many have pointed out that if she were a Muslim, she wouldn’t dare try such thereby debasing the essence of the religion. While some see the ugly side of the photo, some still believe that there is nothing wrong in her dressing and smoking in the outfit as she is passing a strong message. But considering the part of the world we come from there is need to always respect other people’s beliefs and not go against it as it could stir unhealthy rivalry in the country.